Organization is a topic very near to my heart. I so totally enjoy organizing every aspect of my magazine -- keeping records, making sure all the submissions are in order, making lists, etc. I am, by character, quite an organized person (most of the time, anyway ;-) ), so this area has never been a struggle for me, and I praise God for that. Organization is very important -- as the world watches the way we handle our responsibilities, they will immediately notice if our affairs are conducted "decently and in order." If our files and records are in terrible shape, they'll be frustrated, disappointed, and wonder why we aren't different from them, even in the little things we do. On the other hand, a neat, efficient system that lets us serve the Lord to the maximum of our ability, will make the world stop for another look, and wonder what has made the difference in our lives. I read once that the world often sets higher standards for Christians than we are aware of -- they are watching us far more than we realize. What an all-important responsibility we have to demonstrate Christ to them! By relying on the Lord's strength, striving to serve Him better each day, and seeking His direction in all we do, we can be a shining example to those around us. Besides the above, I think the most important key to organization is avoiding procrastination. Take a minute NOW to file that article or send off that sample issue. Make the time you need to sort out the submissions as they come in, or add a new subscriber to your database. If you let things pile up, you'll just be confused and overwhelmed, and important items will likely be forgotten. I'll try to explain my organizing methods to you all -- I've found this system so handy, and have yet to discover anything better. :-) I'm so thankful the Lord directed me to start using this system because I know it'd be very difficult for me to keep things in order without it! On the back of the card, I list any additional contact of personal information I want to remember about the person -- e-mail address, website, phone number, age, parents'/siblings' names, how they heard about HW, etc. I also make sure to list any back issues that the subscriber has ordered. I keep all the cards for current subscribers in a card file, arranged alphabetically by last name (I bought a set of alphabetizing tabs, so it's very fast to find a specific card). When a subscription runs out, I remove the card and file it in another (small) card box (also with alphabetical tabs), where it stays until the subscription is renewed. For sample issues, I record them on a card as above -- I use yellow index cards for these, though white would work just as well. If the person subscribes later, I record that as well. If the person does not subscribe, but orders more sample issues, I just record it on the same line as their first sample. I also make sure to number these sample issue cards (in the upper right corner), so they're easy to keep in order. These cards are an invaluable resource to me when estimating how many copies to make of the next issue, etc. This is the card I use to keep track of HW's funds. Money is an important area to have good record-keeping -- I use a card like above (I used a pink highlighter, just to set the lines apart). 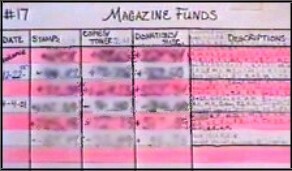 To keep things simple, I divide the subscription donations into two columns (stamps/postage and copies/toner). Any extra donations I receive go in the donation/misc. column. If I used a separate entry line every single time I added or subtracted money, I'd go through thousands of index cards per year. So, what I've ended up doing is having a space for "Description." Here, I write the initials of each person's subscription donation that has been figured in, etc. I very rarely refer to these initials, but they're there just in case. :-) In this way, by erasing and changing the amount in each column, I can make a single index card last at least several months. I keep all the magazine funds I have on hand in a small envelope in the card file (I cut down a regular envelope to just the right size). Whenever money comes in I put it in the envelope only after I've recorded it on the above card. It's simplest to keep all the money together -- the card tells how much I have budgeted for each item. These three cards are the basis of my organizing system. I also use cards to keep track of how many people re-subscribe after each issue, the responses to my annual survey, and anything else I want to keep track of. :-) I use a 1" strip of self-adhesive label folded over on itself to make a little "tab" for cards I use all the time, and I also color-code the cards (if you don't have colored index cards, you can use a marker and color the very top edge of the card) so it's very easy to see where everything is at a glance. I keep all the postage stamps I have on hand in my card file -- I always try to keep plenty of stamps of different denominations on hand. Every other month I buy about $120 worth of stamps and just keep them in the box until I need them. On the inside of the box's lid, I have a chart of postage rates for all the countries I have subscribers in, as well as rates for sending packages to the U.S. Other things I keep in my box are a mini calendar stuck on the inside of the lid, and the little stickers I use to close the issues when I mail them. It saves me lots of time to have all these things at my fingertips when I need them, and I rarely lose anything. One thing I've done for several years now is to keep a running total of how many subscribers I have. I use sheets of small graph paper for this, and fill in the blocks, changing the total every time I gain or lose a subscriber. This obviously isn't a necessary thing to minutely keep track of, except for the purpose of knowing how many copies to make, but I have found it fascinating to watch how the number fluctuates! :-) I keep this chart, folded, in the card file. Now, about address labels... I always had to lay them out manually on the computer (a lot of work, but possible!) until I bought the latest version of Microsoft Publisher, which comes with an easy-to-use mailing list program -- it has really simplified things for me! I print out an extra copy of this mailing list (on paper, not labels) and keep it in my card file). Whenever someone resubscribes, has an address change, or anything, mark the changes right on their entry. I wait and make all the changes on the computer at once, right before printing the new set of labels and the new extra copy. This is so much simpler than having to start up the computer, open the file, and make the needed changes each time! I have a small shelf made for letters (from a thrift store) sitting on my desk. It has 5 partitions in it, and I use it to file my incoming mail. Letters that I can answer immediately (sample issue requests, back issue orders, new subscriptions, etc.) I lay on top the shelf and answer them ASAP -- I always try to answer these types of letters the same day I receive them, if at all possible -- otherwise they pile up, take a long time, and can appear overwhelming. Other letters, which I won't be responding to until the next issue is mailed out are filed in the shelf partitions: one section for letters that will take longer to answer, and another for notes that require only a short answer. 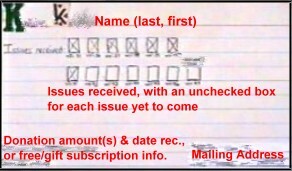 Since I often have up to 50 letters to respond to with an issue, it's important for me to keep them organized. :-) After the letters are answered, I put the ones I want to keep in a filing drawer in alphabetized folders, so they're easy to find when I need to refer to them. If any incoming letters include submissions, I take them out, make sure they're labeled with the contributor's name and location, and put them in my submission file (an expandable, 8.5"x11" file pocket). On the envelope they came in, I jot down what was sent, and file the envelope with the letters to answer -- that way I can remember to thank the person who sent them. 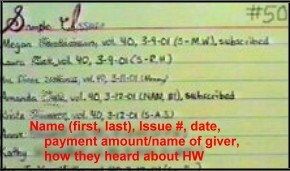 For each issue, I have a page (in a notebook) where I list all of HW's sections (ads, letters, book reviews, etc. 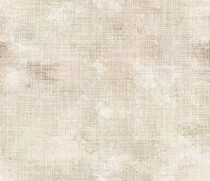 ), columns, and include a section for thematic articles, and other misc. things I need to print. Each time I receive a submission, I make note of it under the appropriate section. I have found this so handy, because I can see at a glance if, for instance, I've included all the ads that have been submitted for this issue, or if I have a particular need in a certain column. I highly recommend that all editors use a system like this -- I know it'd be very easy for me to forget submissions otherwise! Submissions I don't use, or am not sure when they'll fit in (and other odd articles I've gathered together myself) are filed in a file drawer. I have a folder for longer articles, one for poems, one for quotes and tidbits, and a misc. folder. I file the extra clipart I have in an other expandable file pocket with many sections (sorted according to people, plants, landscapes, etc.). Also, I take another paper and mark off a rectangle for each page in an HW issue, and number them. As I fill pages, I jot down which article is on which page, and how much room it took up. This makes it easy for me to see how much empty space I have left, and makes re-arranging pages very simple. I think this covers my basic organizing methods: if I haven't made something clear, or you'd like an even more detailed explanation, please feel free to write me -- I'd be delighted to help you if I can. I hope this hasn't been a discouragement to those of you who are searching for better organization methods, but rather an inspiration! Even if organization isn't a naturally easy area for you, finding and using the right methods will be a great help in simplifying the process. If what I've explained here is seems too complicated for you, there's sure to be a method out there that will work. The key is finding a system and sticking to it -- don't give up! Ask the Lord to give you direction, and He will help you.